Once upon a time a little boy aged 7 and 1/4 was sent a book called ‘The Christmasaurus’ by the kind people at Penguin Random House and he absolutely loved it! 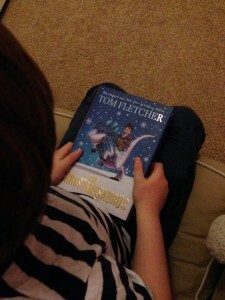 My son is very excited about Christmas this year and loves dinosaurs so this book by Tom Fletcher is perfect for him, we’re currently reading a chapter every night at bedtime and there’s always pleading to “just read a bit more mummy”. Penguin Random House think that books make the best Christmas presents, (they do admit they might be biased), because they are full of unforgettable characters and unexpected adventures. They are stories that can last a lifetime with no batteries required. I think the Christmasaurus will be a firm favourite in our house for a long time, it has a dinosaur, elves with funny names like Snozzletrump and even Santa! You can read an extract from the first chapter here. 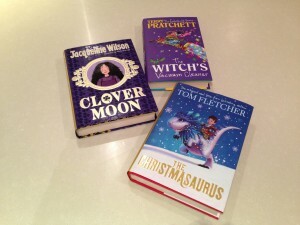 Some other books which Penguin Random House sent us were “The witche’s vacuum cleaner” – a collection of 14 funny stories by one of my favourite authors – the late, great Terry Pratchet, and “Clover Moon” by Jacqueline Wilson, the adventures of an unusually named girl from Victorian London. All three would make great gifts, whether to read together at bedtime, or for older children to read by themselves. I used to spend hours reading as a child, everything from Roald Dahl to Tolkein. I hope that my children will grow up to love books as much as I do and finding funny, engaging books where they can’t wait to find out what happens next is the best way to do that. So if you’re looking for an extra present for under the tree why not try one of these books? If nothing else it’s easier to unpack than the toys which I’m fairly sure were packaged people with a grudge against parents.